PT Citilink Indonesia - Citilink is a reputable airline company in Indonesia with strong business focus on low-cost carrier airline (LCC) segment. PT Citilink Indonesia is a major player in the LCC industry in Indonesia. 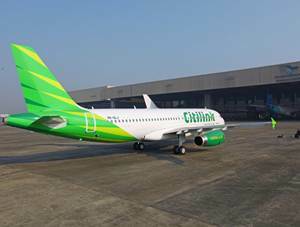 Citilink maintains 16 percent market shares of Indonesian LCC segment. PT Citilink Indonesia is a member of state-owned airline giant PT Garuda Indonesia (Persero) Tbk (Garuda Indonesia Group). At present, Garuda Indonesa Group is the majority shareholder in Citilink with a 94.3 percent stake, while the remaining 5.7 percent was owned by PT Aero Wisata. PT Citilink Indonesia was formed in 2009 as a result of spin-off from the strategic business unit (SBU) of PT Garuda Indonesia (Persero) Tbk. In 2012, PT Citilink Indonesia has officially established as an independent airline company after gained the airline business of SIUAU/NB-027 (dated 27 January 2012) and the airline certificate of AOC 121-046 (dated 22 June 2012) with IATA flight code "QG", ICAO "CTV" and call sign "Supergreen". Based in Jakarta, Citilink now has 54 scheduled flight routes and 27 cities. As of December 2015, Citilink runs its business through 44 aircraft units which include 5 units of B737-300, 3 units of B737-500, and 36 units of A320-200. In term of financial performance, PT Citilink Indonesia performance achievement throughout 2015 showed satisfactory results. According to PT Garuda Indonesia (Persero) Tbk Annual Report 2015 as cited by JobsCDC.com, Citilink registered total revenue of US$470.03 million in 2015. This total revenue figures reflected an 16.48 percent increase from US$403.54 million in 2014. Indonesian citizen (WNI), Male or Female with the maximum age of 25 years old. Minimum holds Bachelor Degree (S1) majoring in Business Administration, Aeronatika with GPA min. 3.00 within 4.00 scales. Willing to be assigned to whichever unit and/or branch office according to company's needs. Indonesian citizen (WNI), Male or Female with the maximum age of 30 years old. Minimum holds Bachelor Degree (S1) with GPA min. 3.00 within 4.00 scales. Minimum 3 years of experience in airlines and services company. Minimum holds Bachelor Degree (S1) majoring in Business, Finance Management, Accounting with GPA min. 3.00 within 4.00 scales. JobsCDC.com now available on android device. Download now on Google Play here. Please be aware of recruitment fraud. The entire stage of this selection process is free of charge. PT Citilink Indonesia - Fresh Graduate, Experienced Officer Garuda Indonesia Group May 2017 will never ask for fees or upfront payments for any purposes during the recruitment process such as transportation and accommodation.